The economic and social problems of modern Scotland are at the centre of current debate about regional economic growth, social improvement and environmental rehabilitation. In this book, as relevant today as when it was first published in 1975, Anthony Slaven argues that the extent and causes of these problems are frequently underestimated, thus making development policies less than fully effective. The major economic and social weaknesses of the west of Scotland are shown to be rooted in the regions former strengths. The author demonstrates how, although the region and its people have resisted change, a thriving and self reliant nineteenth-century economy , based on local resources and manpower, has given way in the present century to vanishing skills and products, unemployment and social deprivation. Since 1945 economic and social planning has helped to improve the situation, although many difficulties remain. 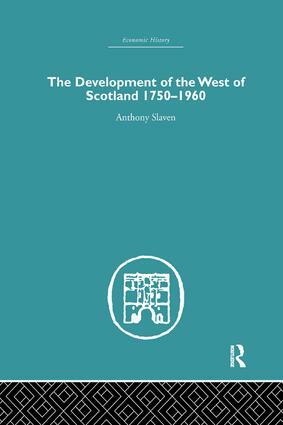 Seen in the historical perspective provided by this revealing study, the present industrial problems of the west of Scotland, and their remedies, become clearer. Mr Slaven argues that the older industries deserve more help, for without this, he believes, the ineffectiveness of development policies is likely to be perpetuated. This book was first published in 1975.